The Super Ultimate is urban level security in a high-tech minimalist design. Like the Ultimate 420, the Super Ultimate uses a 14mm temper hardened steel round shackle but make no mistake this lock is a higher security option than its little brother thanks to the more optimized and advanced materials used. 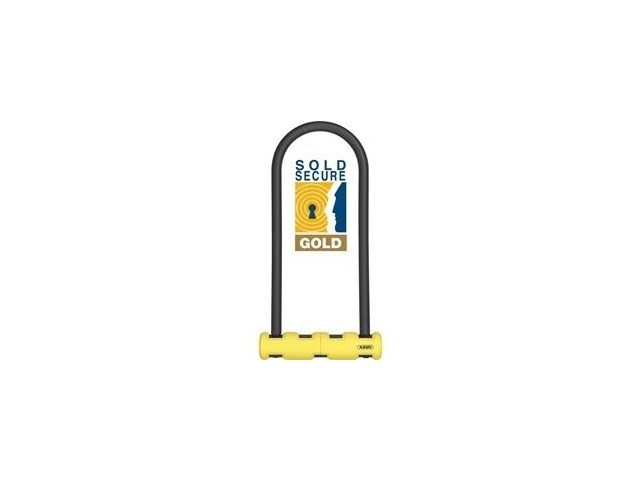 The shackle extends completely through the lock body providing even greater protection against torsion/twisting attacks and the shackle double bolts in the lock body. The Super Ultimate features an innovative soft touch cover that protects your frame and, like all ABUS locks, feature industry-leading corrosion resistance. The bright yellow lock body gives it a visible and distinctive look. Supplied with the proven, rattle-free USH universal frame bracket, this lock packs more features than anything else at this price point. 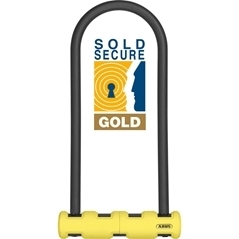 The Super Ultimate 430 is insurance approved to Sold Secure Gold level and available in standard 230mm or long shackle 300mm versions.